Brian Clarke’s playing career began at the age of 9, in 1945, with the village band in Earl Shilton, Leicestershire. This was followed with a spell with the Leicester Imperial Band where he was a member of their highly successful prize-winning Quartet party. Brian later joined the City of Coventry Band to serve as Principal Cornet for 27 years. 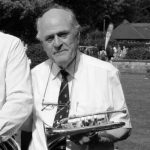 Brian left City of Coventry Band in 1979 and, shortly afterwards, became a member of the GUS Band, where he remained for six years as assistant Principal Cornet. My 30+ years with Bilton, (in a few different categories,) have been a source of much enjoyment! Following a short break from banding for business reasons Brian was approached by Bilton Silver to take the Band to the 1988 Midlands Area Contest. That invitation saw Brian commence as Bilton`s Musical Director for the next 22 years. He retired from this position in 2010 but was soon after invited back, this time to play cornet. Brian’s influence at Bilton saw many notable successes and a progression culminating in the band being promoted to the Championship Section for 2016.